Jacob Westerman (16) is greeted by teammates after his second-inning home run gave Big Train a 1-0 lead. The Bethesda Big Train (34-6) completed a historic regular season in the Cal Ripken League on Friday night when it edged the FCA Braves (18-21), 6-4, in Annandale, Virginia. 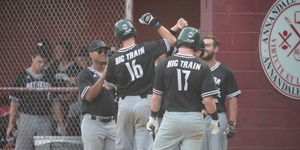 With the win, Big Train broke its team record for wins in a regular season of any length with its 34th triumph of the year. The game, which was close throughout and included major playoff implications for the Braves, first came to life in the second inning, when second baseman Jacob Westerman (San Francsico) hit a solo home run to hand Big Train an initial lead. The first of the game’s many swings came in the fifth, when the Braves took the lead. After a solo shot by first baseman Jeff Steuck, third baseman Brett Norwood singled and stole second before being driven home on a double by leftfielder Devin Mangum. The Braves would tie the game in the bottom of the inning via another solo home run, but Bethesda retook the advantage again in the seventh when Villaroman doubled to score catcher Ben Martz (Santa Barbara Community College). The Braves knotted the score once more in the bottom of the inning but left the bases loaded when an RBI single was followed by a strikeout and a groundout to end the inning. Missed opportunities became a theme over the course of the game for the Braves offense, which left 13 total runners on base. After a scoreless eighth, Westerman and Martz each walked in the ninth, bringing up leftfielder Andrew Shebloski (St. Mary’s) with two outs and a chance to take a late lead. “I was just looking for any pitch in the zone,” Shebloski said. “I just took a deep breath, saw a fastball and hit it hard.” By the end of the play, Shebloski found himself celebrating on third base with Westerman and Martz having scored on his game-winning hit. Bethesda finishes the regular season with new league records in runs scored (326), walks drawn (238), winning percentage (.850) and on base percentage (.413). Outfielder Justin Wylie (Arizona), who didn’t play Friday, set a team record for batting average (.417). The Braves missed a chance to clinch a playoff spot on Friday and will play a virtual must-win game against the D.C. Grays on Saturday to complete their regular season. Big Train will await the results of Saturday’s regular season finales and Sunday’s first round of playoff games to learn their opponent in the league semifinals, which will begin Monday at Povich Field.